1. Line 15x10x1-inch pan with foil. Heat oven to 400°F. Spray 12 regular-size muffin cups with cooking spray. In large bowl, mix bread crumbs and milk. Let stand 5 minutes. 2. Add onion, carrot, bell pepper, garlic, rosemary, turkey, salt and pepper. Stir to combine. Divide mixture evenly among muffin cups (about 1/3 cup each). Top each with 1 tablespoon pasta sauce and 1 slice pancetta, formed into a round to cover. Placed pan on rack below muffin pan to catch any drippings. Bake 18 to 22 minutes or until thermometre inserted in centre of loaf reads at least 165°F. Let stand 5 minutes. 3. To freeze: Line muffin cups with paper baking cups before filling with mixture. Top with sauce and pancetta. Freeze unbaked meat loaves until firm, about 1 hour. Transfer meat loaves to large resealable freezer plastic bag; freeze up to 3 months. 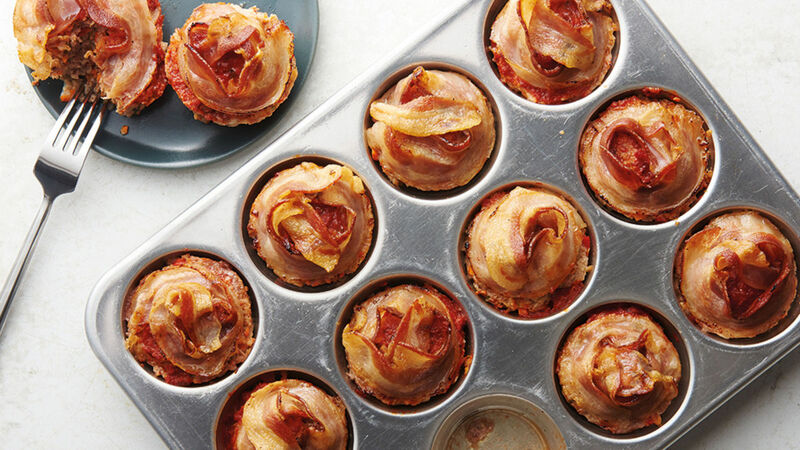 To bake, remove paper baking cups; spray muffin cups with cooking spray, and place meat loaves in muffin cups. Cover with plastic wrap; thaw in refrigerator overnight or until completely thawed. Remove plastic wrap; bake as directed. For faster preparation, roughly chop onion, bell pepper, carrot, garlic and rosemary, then pulse in food processor until finely chopped. Can’t find thinly sliced pancetta? Place pancetta in freezer for 10 minutes before slicing, and use a serrated knife for easy slicing.